March 2014 – Remember; No Matter Where You Go, There You Are! 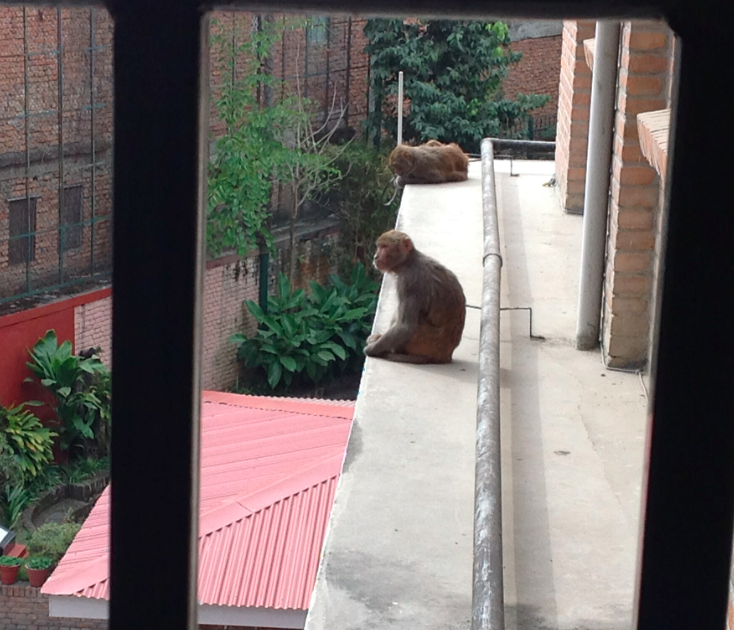 The monkeys have been very bold of late parading about school and on the electrical wires outside of our house. But I’ve always had a fair distance between them and me. That is until this week when I returned to my classroom after lunch to discover two monkeys walking down the hallway on the third floor. I quickly ran into my room to get the iPad to take a picture of them but they were gone. So I slowly walked down the hallway and saw two more out on the window ledge overlooking the Pre-School playground. I think they were eyeing the “monkey bars” No sooner did I snap this shot when another monkey hidden by a pillar starts climbing over the railing just two feet from me! Aaaaaaaa! With my heart pounding I quickly ran back to my room and shut the door. Fortunately the custodian came by to tell me to stay in my room while he shooed the monkeys away! That evening I searched for 5 rupee bills (5¢) for the morning. The start of the festival Shivaratri began early in the morning with children stretching rope across the roads. In order to pass by you need to pay them some money. They were delighted with the 5 rupees I gave them. I only encountered 2 groups along my way to school. They use the money to buy wood for the bonfires they would light later that night. They sit vigil around the bonfires at the various Shiva temples throughout the town. Today was a school field trip to one of the Tibetan monasteries near the school. We sat on our cushions on the floor and watched the monks perform traditional dances to send away all the negative energy from the past year to welcome in the new year beginning tomorrow. The dances went on for 2 hours and the kids were all troopers sitting for that long. The costumes were fascinating with beautiful embroidered brocade and papier mache masks. We had front row seats in front of some lovely elderly Tibetan women. It would have been a great week but one thing was missing. My sweetie! He is in Mumbai at a tech conference.